Great prices on quality Exselle Elite Square Raised Bridles, horse supplies and many great equine products at Horse Tack Now. 100% satisfaction guaranteed. The Square Raised English Bridle features 5/8'' laced reins, with elegant stitching on the brow band and nose band. This particular Square Raised Bridle is made of durable material and will provide maximum durability even when used on a daily basis. 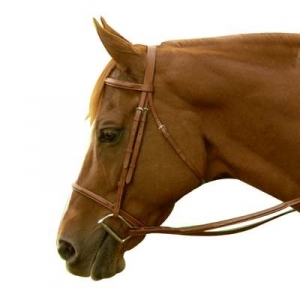 The Rich New Market Square Bridle also features two layers of leather on the cheeks and reins to attach to the bridle. Also features roller buckle on nose band. Made with Italian Leather.